Autotune and pitch correction has a variety of uses, from fixing subtle imperfections in a vocalist’s performance to extreme effects such as the famous sound popularized by T-Pain and utilized by Daft Punk, Black Eyed Peas, Cher, and many more. Furthermore, you can even record organic instruments and give them a natural, flowing, and gliding sound! As a result, there are tons of possible uses to consider with an autotune VST. However, many of the popular autotune plugins will burn hundreds of dollars out of your wallet, and with the wealth of available autotune and pitch tuning plugins, finding the right one for your specific needs can be overwhelming. So to help you out, we’ve compiled a list of seven completely free autotune VST’s that still have incredible functionality! To get started, let’s briefly go over what to consider when searching for these crucial plugins. There are a few points to go over before deciding on which autotune and pitch-correction plugins are the right ones for you. Most importantly, what do you need these tools for? If you produce a genre outside of EDM that might call for more organic sounds, you’ll want an autotune plugin that’s designed for smoother and more subtle pitch-correction. This way, you’re simply making minor corrections that likely won’t be heard by your audience and will still sound natural. Thus, to keep the organic feel of your sound, you should search for a pitch correction plugin with a transparent audio engine that won’t color your sound too much, so that it guarantees a seamless, smooth, and untouched sound for your acoustic needs. On the other hand, if you produce hip-hop, trap, or certain electronic genres, you’ll have to consider an autotune plugin that allows you to draw in the notes you want the singer or instrument to hit. Additionally, you might need effects that allow you to further customize the voice, such as formant control, MIDI input, and others. That way, you can jump up and down in volume and pitch as you please! So, there are a lot of things to consider before choosing which plugin is right for you. Now that you have a better idea of what to look out for, let’s jump right into the 7 best and completely free autotune plugins available in 2018! MeldaProduction, a renowned audio plugin company used and promoted by Deadmau5, was kind enough to create a completely free and fully functioning autotune plugin! This plugin give you options such as depth, detune, and speed, which are standard on most pitch correctors. Depth controls how much effect the VST has on the entire sound. Detune will push the pitch of the sound up or down by cents for sharp fine-tuning purposes. The speed knob will control how fast MAutoPitch will respond to out-of-tune notes. If you’re looking for a smoother sound, using a low speed value will ensure that transitions between notes aren’t jumpy and fake-sounding. Otherwise, if you want something closer to the T-Pain effect, you’ll want to turn the speed up very high so that it skips quickly from one note to the next. What’s great about this plugin is that, like a lot of Melda’s works, there are a wealth of bonus features that come along with it! For example, MAutoPitch includes an effects rack. With this, you can control how heavy the effects work on the sound with the dry-wet knob, spread the stereo image with the width function, and even shift the formants. Shifting formants will make your sound deeper and more “masculine” sounding or higher and more “feminine” sounding, but you need to be careful with this. If you alter the formant way too much you might also alter its pitch. This is achieved trying to imitate how the human vocal tract works and even the shape of the singer’s mouth while singing, through complex filters. Formant shifting will also have a huge influence on vowel sounds and certain consonants, and if you are interested in this topic, we really recommend you reading this article. This subject is too complex and outside of the scope of this article. A visual detector displays what notes are being detected by the plugin, and a scale function enables you to select what scale of music you’re on. This way, MAutoPitch only shifts pitch to the perfect notes according to the key your track is in! Also included is a limiter, which helps keep your sound below the 0 db threshold so it doesn’t clip. The wealth of features available on MAutoPitch, along with the high functionality and easy interface, makes this free VST something you’ll want in your autotuning arsenal. One of the original free pitch correction plugins, Graham Yeadon’s GSnap, still is among the elite. That’s partially because of its unique ability to adjust notes according to MIDI that you can feed into it! For example, if you want to correct a vocalist’s notes, you can play their part on a piano, feed the MIDI notes from the piano into the plugin, and GSnap will use those notes as a guide to where it will correct. Not many other plugins can do this, and it’s an incredibly powerful and advantageous tool to use! 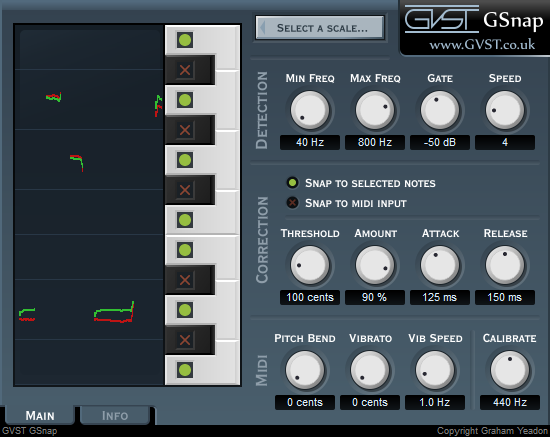 An easy visual interface on the left of the VST shows exactly how GSnap is fixing the sounds. The original sound is in red, and the adjusted notes are highlighted in green. This is perfect for figuring out exactly how to fine-tune the sound and to know what’s going on. Twelve fully adjustable knobs allow for precise editing of the effect. Furthermore, this plugin enables you to add vibrato and adjust the speed of it! This is something not seen in other plugins like MAuto Pitch, for example. Vibrato is an up-and-down pitch and volume effect that essentially makes the singer sound a lot more organic and talented, and it works across multiple genres when used correctly. Also included in the detection section is a gate, which is a unique way of controlling how much GSnap has an effect on the sound. It can be adjusted so that GSnap only has an effect on the loud or quiet parts, if needed. As GSnap is well-known among experienced producers for its versatility, MIDI feed options, and easy interface, it’s easy to see why this free plugin is worth a grab! 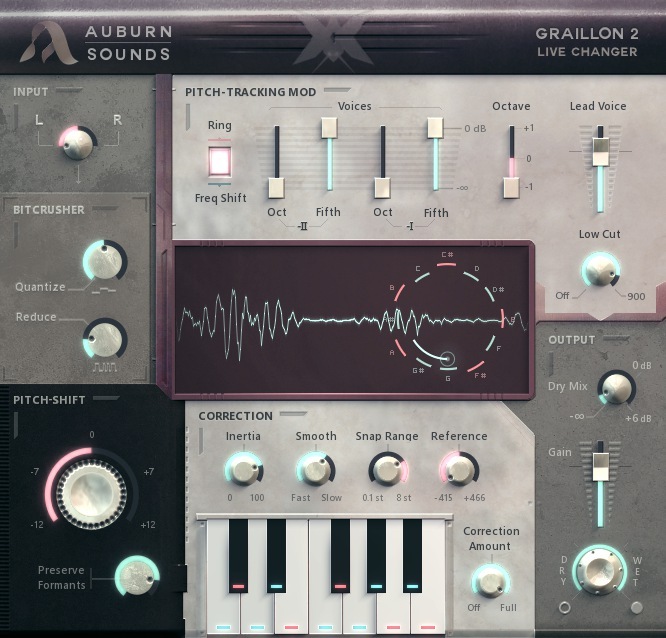 No list of autotune plugins, free or otherwise, would be complete without the recently released free version of Auburn Sounds’ Graillon 2! From first glance, you’ll notice a beautiful vintage-looking interface with large fonts and a standout color scheme that makes it easy to navigate. An easy central waveform display shows where the current note of your sound is, as well as exactly where Graillon 2 is correcting it. Behind the eye-catching and functional design is a well-programmed plugin that can perform both heavy autotune and fine pitch correction functions flawlessly! For easy and quick use, simply adding it as an insert on your desired channel and turning on the correction will suffice in most cases. To adjust, use the critical “inertia” knob as a “speed” knob mentioned previously. It reduces pitch correction jumps by helping notes “stick”. You should be careful with this function, however, as some notes may “stick” for too long, hence altering the melody altogether. If you’re looking for a robotic sound, adjust the “smooth” knob in the correction module, which controls how slow or fast your sound will jump from one note to the other. Yet another feature available on Graillon 2 is the “bitcrusher” area on the left side. Even more, it can make a voice “growl” as well as reinforce the bass portion of monophonic pitched sounds, a function unique to Graillon 2. With proper adjustment of the quantize and reduction knobs, you can get sounds that are highly distorted, “bitcrushed”, or a robotic growl sound by reducing the reduction knob. Graillon 2 can also double as a pitch-shifting plugin with a pitch wheel on the bottom left. There’s also an option to keep the formants of the track along with it, which changes the singer’s perceived vocal tract shape and the shape of the singer’s mouth while singing. If you’re looking for a smoother effect, it’s often best to change both the pitch and the formants at the same rate. Also included are convenient knobs such as dry/wet for overall effect adjustment, a low cut filter, and an adjustable output gain meter. As Graillon 2 is a proverbial swiss army knife in the autotune realm, capable of most features, with an included bitcrusher, growl sound capabilities, and with a beautiful interface, there aren’t many negatives to this one. If you need flawless all-around functionality with a few bonus features thrown in, Graillon 2 is your best bet. The Japan-based, g200kg company created KeroVee back in 2010, and it’s still used for deep pitch correction adjustment today. What KeroVee lacks in extreme robotic effects, it makes up for with ultra-precise pitch adjustment capabilities that are far better than most free autotune plugins! Similar to GSnap, there’s an easy scaled interface on the left side so you can see exactly what KeroVee is doing and respond accordingly. 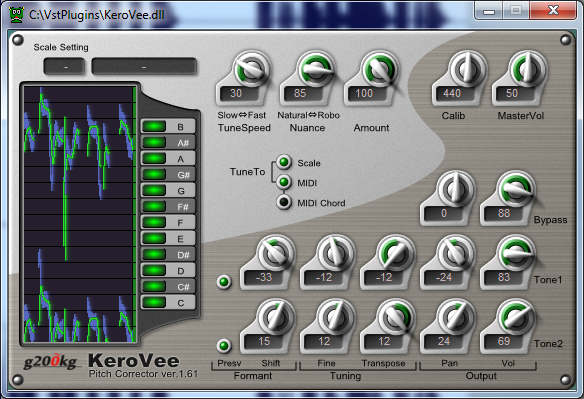 Just to the right of this block, you can click which notes of the scale you want KeroVee to adjust to. Selected notes will have a green block next to them, while deselected notes will be black. Also similar to GSnap, you can route MIDI notes to KeroVee for the plugin to use as a guide. This is a crucial function that lets you tell KeroVee exactly what notes the singer should be on, with a large set of knobs to customize further. Unique to KeroVee is a “nuance” parameter that allows you to keep or ignore subtle pitch changes, such as natural vibrato from the singer. Typical on most autotune plugins, you get a “TuneSpeed” knob which controls how fast the VST will fix the incoming audio. The calib function controls the overall pitch of the sound, and on the bottom are important functions such as pitch and formant shifting, fine tuning for precision work, and panning and volume knobs. If you’re looking for an autotune plugin that is tailor-made specifically for fine adjustment of vocals, rather than a harsh and noticeable effect, KeroVee will be a good place to start. The free download can be found here. X42 Auto-Tune is a simple autotuner based on the zita-at1 by Fons Adriaensen. It’s much better if you use it as a light tonal fixer over a full-on robotic autotuner. It works by resampling the material fed into it and then looping the signal. It does not have any formant correction capabilities. As a result, its uses don’t come from transposing a track, but from subtle adjustments to vocals. Even though the X42 has a specific set of sounds it can perform on, when you use it correctly, it does a goob job! As with the GSnap and KeroVee, it can be fed MIDI from which it adjusts the vocal notes to. Otherwise, you can input a fixed set of notes from any musical key for the program to respond to. Although it shares similarities with other plugins, there are some unique features the X42 has that others don’t. The “Bias” parameter lets the vocals to stay on their current note for a longer period of time instead of moving quickly to one of your selected notes, regardless of if they’re in tune or not. It allows for more off-tune and natural singing sounds. Furthermore, it includes a unique “offset” parameter which adjusts how far the vocalist can venture from the predesigned notes. Like the bias parameter, this will let you to keep some of the vocalist’s minor mistakes for a more organic sounding performance, if need be. What this plugin lacks in formant features, sparkly design, and variability in sound adjustment, it makes up for with unique parameters and fine MIDI control of missed notes. Don’t be fooled by the simple interface! Autotalent by Oli Larkin is a well designed, fully functioning autotune and pitch correction VST. You can use it for light pitch correction and full-on robotic autotune, and it even contains chiptune effects! It includes all of your typical parameters needed in an autotune plugin. It allows smoothing, subtle pitch shifting to scaled notes, and a full formant editing function. With Autotalent, you set notes on the piano scale to “-1” for notes you want to exclude, and “0” if you do want the singer or instrument on that note. Autotalent, unlike any other free autotune VST, offers an extensive LFO and vibrato section. Use this section to add vibrato, skill, and confidence into a vocalist’s performance. The LFO can also be used to add a unique chiptune effect to the vocal or instrument! Chiptune describes a sound that appears to have come from early gaming consoles. So despite a relatively lacking interface, Autotalent offers a wealth of both robotic and smooth autotune options, as well as unique LFO section. If you’re looking for this type of versatility and want to try the plugin-specific LFO module, give Autotalent a try. Listen to a demo of the plugin in action here. 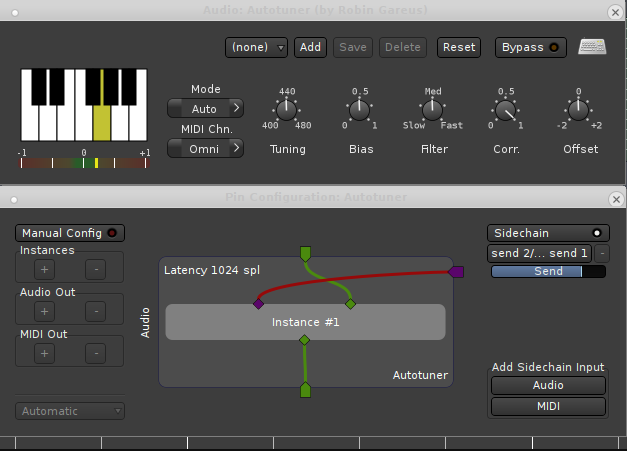 Last, but certainly not least, we’re going to include an interface-less plugin, the AAS Autotune by Arguru. Obviously, without any user interface, you’re only going to have one specific set of parameters working at one time! Use AAS Autotune to get the classic and harsh “T-Pain” effect on vocals. It’s a robotic and fast-moving sound that’s only useful in certain situations, but it works well when it’s needed, such as hip-hop songs that use purposefully autotuned vocals as an effect. It’s ultra simple, but incredibly useful! You can directly download it here. Because of the overwhelming amount of music that includes some sort of vocal or tuned instruments, autotune and pitch correction plugins are an absolute necessity! Hopefully we’ve been able to help you figure out what you want from this class of free plugins. You should be thinking about whether you want the heavy, unnatural, and robotic sound, or a light and seamless touch that the listener’s won’t hear, most often used to put small touch-ups on a vocal performance. Furthermore, we’ve gone through all of the advantages and disadvantages to the 7 free plugins we listed above as it pertains to those needs. All of them have special features unique to the situations they’re used in, and there should be many in this list that fit your autotune needs! Have you used any of these plugins before? Did we miss a free autotune plugin that you love to use?